When you buy beets, you may be discarding one of the most nutritious parts of the vegetable: the greens! These dark, leafy greens are right up there with spinach and chard. When you get your beets home from the farmers market or grocery store (or if you’re growing them yourself), make sure to set the greens aside in the fridge between layers of damp paper towels; they’ll last two to three days and can be used raw, like in this salad, or steamed or sautéed just like other greens. One cup of beet greens has 4 grams of fiber and 4 grams of protein, plus ample vitamins A and K, and minerals like phosphorous and since. They can be juiced just like regular greens too, so throw them in (remove stems first) if you want a protein and vitamin boost. While beet greens do have a strong flavor, it’s not any more powerful than, say, kale. In this recipe, that flavor gets mellowed out by creamy avocado, bulgur and tahini. And beets, of course! 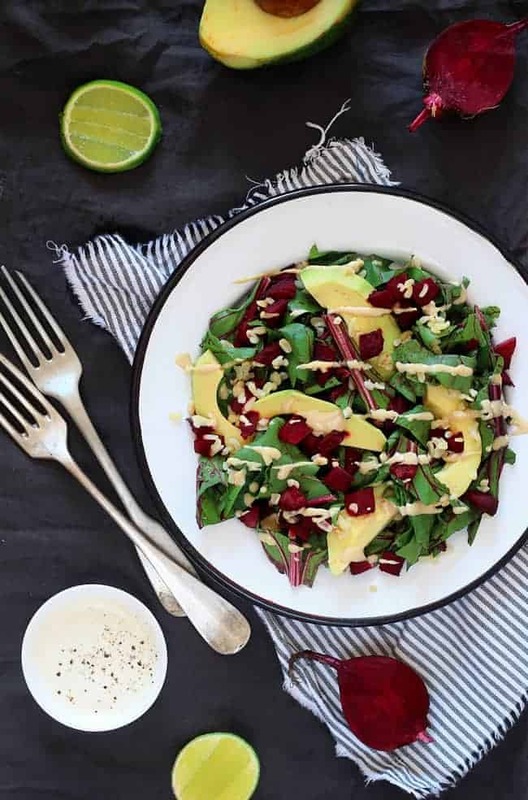 An interesting way to use beets together with their greens - a nutritious salad, with avocado slices and tahini dressing. Peel the avocado, remove the stone and cut in slices. In a big bowl, mix all the salad ingredients and set aside, adding avocado on top gently. Add all the ingredients for the dressing in a blender, and process until smooth. Pour the dressing over the salad, mix to combine, distribute onto serving plates and serve right away. Yum! I grew some beets this summer, and just made a with them. Wish I saw your recipe earlier so I could have also made this salad with the greens! Yum! this looks amazing – I love anything avocado!